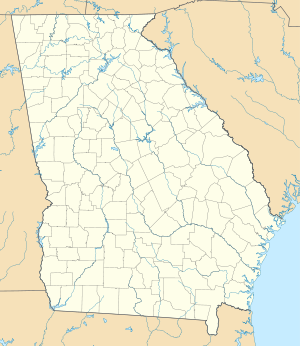 Moody Air Force Base (AFB) (IATA: VAD, ICAO: KVAD, FAA LID: VAD) is a United States Air Force installation near Valdosta, Georgia. On 30 September 1975 the 347th Tactical Fighter Wing moved to Moody AFB from Korat Royal Thai Air Force Base. On 1 October 1991 the 347th Tactical Fighter Wing was redesignated the 347th Fighter Wing. On 1 July 1994 was redesignated the 347th Wing, a composite wing with fighter, close air support and airlift elements. On 1 April 1997 the 41st Rescue Squadron and the 71st Rescue Squadron moved to Moody from Patrick Air Force Base and the 23d Wing was assigned to the 347th Wing. On 30 June 2000 the 70th Fighter Squadron was inactivated at Moody. On 2 February 2001 the 69th Fighter Squadron was inactivated at Moody. On 30 April 2001 the 68th Fighter Squadron was inactivated at Moody. On 1 May 2001 the 38th Rescue Squadron was activated at Moody and the 347th Wing was redesignated the 347th Rescue Wing. On 21 July 2007 the 479th Flying Training Group was inactivated and its aircraft and equipment were redistributed to other AETC units. On 1 October 2003 the 347th Rescue Wing was assigned to Air Force Special Operations Command. On 1 October 2006 the 23rd Fighter Group was redesignated as the 23d Wing and activated at Moody AFB. On the same date the 347th Rescue Wing was inactivated and the 347th Operations Group was redesignated the 347th Rescue Group which became a subordinate element of the 23d Wing. ^ a b c d e f g h i j k l m n o p q r Manning, Thomas (2005). History of Air Education and Training Command, 1942–2002. Office of History and Research, Headquarters, AETC, Randolph AFB, Texas. p. 17. ASIN B000NYX3PC. ^ Ravenstein, Charles A. (1984). Air Force Combat Wings, Lineage & Honors Histories 1947-1977 (PDF). Office of Air Force History. pp. 182–4. ISBN 0912799129. ^ a b c d "347 Rescue Wing (AFSOC)". Air Force Historical Research Agency. 27 December 2007. Retrieved 18 January 2018. ^ Dollman, TSG David (11 October 2016). "Factsheet 41 Rescue Squadron (ACC)". Air Force Historical Research Agency. Retrieved 18 January 2018. ^ Bailey, Carl E. (27 March 2015). "Factsheet 71 Rescue Squadron". Air Force Historical Research Agency. Archived from the original on 27 September 2015. Retrieved 18 January 2018. ^ "68 Fighter Squadron". Air Force Historical Research Agency. 7 August 2008. Retrieved 18 January 2018. ^ "69 Fighter Squadron". Air Force Historical Research Agency. 9 March 2010. Retrieved 18 January 2018. ^ "68 Fighter Squadron". Air Force Historical Research Agency. 9 April 2008. Retrieved 18 January 2018. ^ Robertson, Patsy (6 February 2015). "Factsheet 23 Fighter Wing (ACC)". Air Force Historical Research Agency. Archived from the original on 27 September 2015. Retrieved 18 January 2018. Wikimedia Commons has media related to Moody Air Force Base.